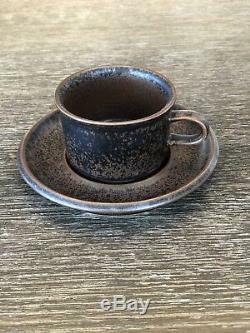 Gorgeous ceramic coffee and tea set from the iconic Ruska pattern produced by Arabia of Finland. Vintage 1960s, from my grandmother's collection - ready for a new, loving home. Perfect for decorating your holiday table. 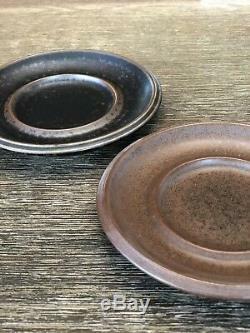 Classic midcentury modern design, typifying the Scandinavian aesthetic with its clean lines and rustic coloration. 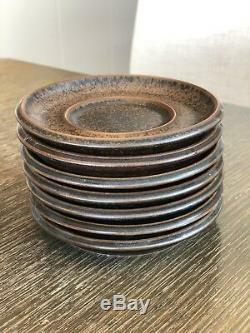 Ruska dishes are incredibly versatile, elegant enough for serving, but also durable enough for heating, braising, baking, and even storing in the freezer. Production of the'Ruska' pattern was discontinued in 1999. Pieces of this caliber are exceedingly rare, especially as a complete set. 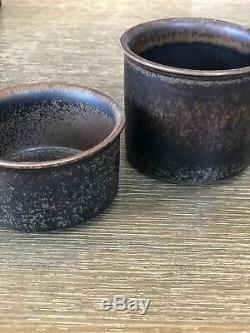 Mixture of dark, melange, and chocolate glazes for an attractive, complimentary palette. Coffee pot with lid: 7.5 in. 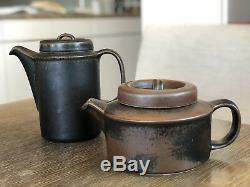 Tea pot with infuser and lid: 5 in. 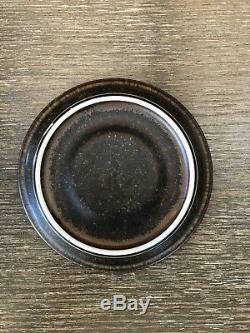 (10) saucers: 5.5 in. 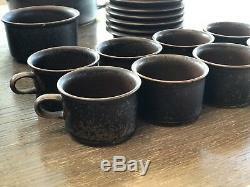 (8) espresso cups: 2.75 in. 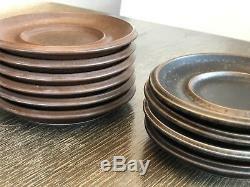 (7) espresso saucers: 5 in. Excellent condition for their age. Have been tucked away safely in storage for many years. 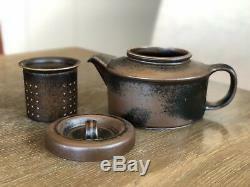 Taller coffee pot shows a few surface scratches (as shown in photos) which may be buffed away with professional cleaning; otherwise, simply perfect vintage condition. All photos are representative of set; please inquire with any additional questions. 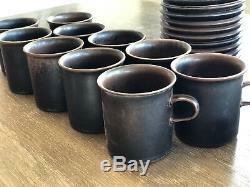 The item "Vintage Arabia of Finland Ruska Ceramic Coffee Tea Set Rare Midcentury Modern" is in sale since Saturday, October 27, 2018. 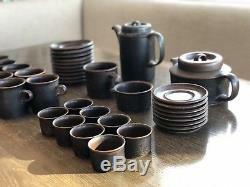 This item is in the category "Home & Garden\Kitchen, Dining & Bar\Dinnerware & Serving Dishes\Teapots". 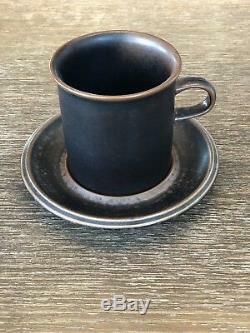 The seller is "raufuiste" and is located in San Francisco, California. This item can be shipped worldwide.